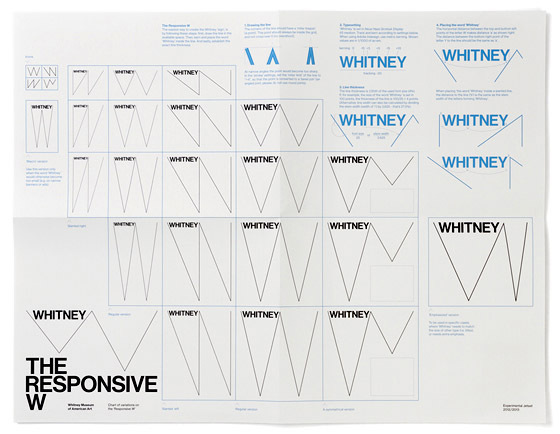 With its imminent move downtown to new Renzo Piano-designed digs, the Whitney Museum of American Art decided that its graphic identity was also in need of an overhaul. And so it’s out with Abbott Miller‘s 13-year-old wordmark (which, like a fine wine, would only have gotten better with age) and in with a…spindly, shape-shifting line? The new identity, created by Amsterdam-based Experimental Jetset and unveiled today along with the museum’s redesigned website, is an anti-logo: lacking distinction, gravitas, and the ability to be seen from across a room. The “responsive ‘W’,” intended to dynamically “illustrate the museum’s ever-changing nature” with an elastic take on the letter “W,” is paired with a redrawn version of Neue Haas Grotesk, in all caps. With an infinite array of options, the identity can evoke the work of Dexter Sinister or Lawrence Weiner, the slanting logo of W magazine, or a line graph that got lost in a museum on its way to a sales report. But mostly, it leaves us wondering, Why?